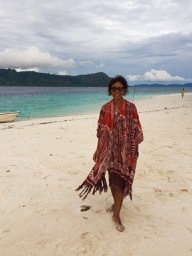 I was on a Food as Medicine cruise around the Moluccan Islands of Indonesia** and when we weren’t wandering around far flung market places, with sights and smells of the exotic, we were cooking up our finds on the boat and eating it – and then snorkelling off beaches like this. 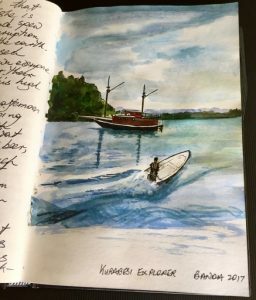 We were sailing around the Banda Islands on the Kurabesi Explorer, a three year old timber phinisi – the traditional trading boats of Indonesia and, if you didn’t notice the stand-up-paddle boat strapped to the side, you could be looking at a scene from three of four hundred years ago as we sailed in and out of this timeless landscape. 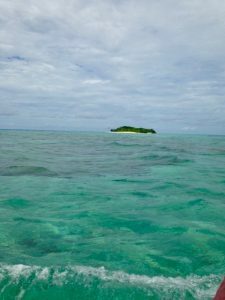 Now we had dropped anchor and were about to explore the underwater wonderland of Molina atoll and then sit on the beach, sipping a coconut cocktail, and watch the sun go down. Travel takes you to some unexpected and interesting places – Molina was one of them. Everything you see growing on this island was brought here on the tide by seeds that float on the ocean currents – like this assortment that I picked up that day. Nothing epitomises the peripatetic, but successful, nature of plant life in the tropics than the bobbing coconut ‘ship’ that sails the seven seas and takes root on some distant shoreline – under the shade of which I was sitting right now, possibly hundreds of kilometres away from the mother tree, with a seed that has been nurtured in milk and protected by a strong, waterproof husk. Next is the immature seed of the Barringtonia asiatica. This is a beautiful small tree of Asian shorelines with its loveliness and potential now being recognised as a useful street tree in tropical cities like Darwin. 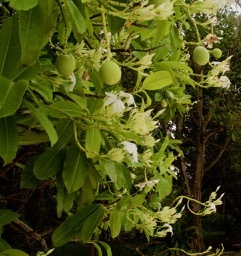 All parts of this tree are toxic* and is traditionally used in the tropics as a fish poison. It has a pretty, silky, pink and white pompon flower and a very attractive box-like seed with a cross on the top and is known as the Peace Seed by my Indonesian friends. It floats around from island to island and can be viable for up to 15 years; being the first plant to germinate on what was left of the Indonesian Krakatoa volcano when it blew its top in 1883 destroying 70% of the island, causing a global climate catastrophe and killing more than 36,000 people. The seeds of this tree survived and brought life where all else had perished. 3. 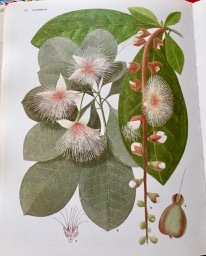 The small red three-fingered flower is from a very large local mangrove tree and, I was told, that the locals use the soaked seeds (contains toxins!) for making a biscuit flavoured with nutmeg and kenari seeds (Bandanese almonds). Mangroves are often overlooked as being a pretty useless and bothersome plant to coastal communities and the first to be grubbed out. But I’ll ask you this. Which of the world’s great forests store the most carbon per hectare? The dense tropical forests of the Amazon, Borneo, the Congo or Papua New Guinea? The vast northern forests of Canada or Siberia? In fact, none of the above. 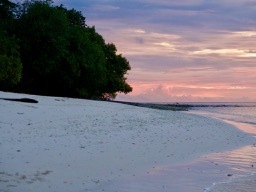 It is MANGROVE FORESTS of which Indonesia has 25% – alas rapidly diminishing – and the most to loose with little protection from government legislation. It is ironic that they are mostly being cleared for aquaculture projects – thereby dramatically decreasing the natural breeding ground for fish and marine life that mangroves provide. “It is a tragedy that some of the most valuable forests in the world (Indonesian mangroves) are being converted to a relatively low value and unsustainable land use with little benefit to the local communities” Robin Lewis. 2015 Charles Darwin University. 4. 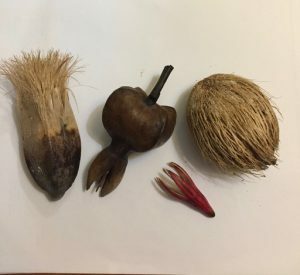 So, now we get to number four of my beach-combing botanical wonders – the wiry seed that looks like the inside of a small coconut, in fact, that’s exactly what I thought it was. It wasn’t until I got home that I discovered that it was the dried seed case from the beautiful tree with the fragrant white flowers and round green fruit that I had admired so much on Molina Island. The beauty of this pretty tropical tree hides a deadly secret. I discovered that it is just about the most poisonous plant in the world and is said to be responsible for more deaths from plant poison than any other. Who’d have thought it? Who would have also thought that this plant, Cerbera odollam, amusingly known as the Pong-Pong tree in Indonesia is known just about everywhere else as the SUICIDE TREE. 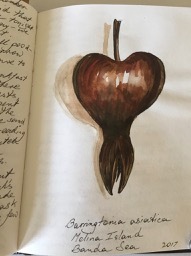 It belongs to the same family as oleander and, in my research, I often saw it referred to as the perfect murder weapon and is notorious for being overlooked as a cause of death in autopsies. In a recent ten year period in the southern Indian state of Kerala alone there were 537 identified cases of fatal Cerbera poisoning. It is apparently easy to disguise the flavour with spices. Those lovely looking fruit contain a toxin called cerberin, a potent compound capable of disrupting calcium ion channels in heart muscle, which can lead to irregular heart beat that is often fatal. In India, the seeds from this plant are one of the most common means of committing suicide – hence the grisly name. Waiting for the bar to open! Travel takes you on all sorts of journeys – some totally unexpected and many of them of the mind. It wasn’t until I got home and did some research that I realised that just about everything I had picked up or looked at that day, apart from being really fascinating, was also toxic. Indeed, I had a close shave with the most toxic plant in the world. 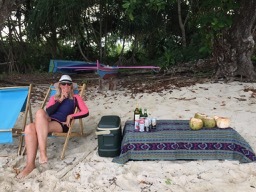 But, I was oblivious to all of that as I sipped my coconut cocktail and watched the sun going down on another day in paradise. With thanks to fellow travellers Ros and Lucky for photos. **Our trip was organised by Janet de Neefe from Casa Luna Cooking School in Ubud Bali and you can contact her if you want to find out more. *It is not a good idea to go munching any plant that you can’t identify because, I think that you would find, even the non-toxic ones could make you feel more than a bit crook. However, I am not of the growing Nanny State school of thought that says you have to remove every plant from every public place that is known to be toxic because we are all going to have them for lunch instead of a sandwich. This would mean removing just about every common garden plant – including frangipanis. Just a pinch of common sense and education is required, don’t you think? 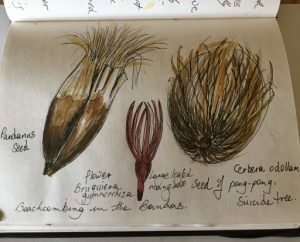 By contrast, although every plant I encountered here had toxic potential, the local people had learned how to render them harmless and utilise their value – well, mostly, because I didn’t see any Pong-Pong tree curry! !